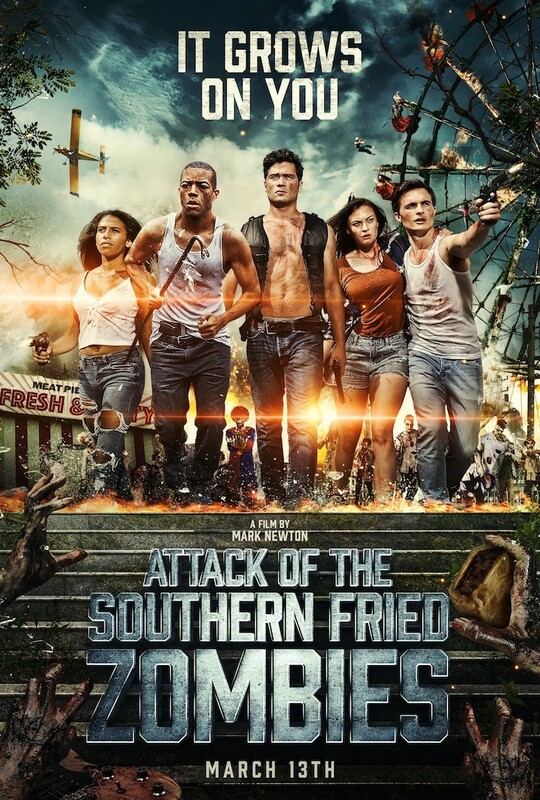 Gravitas Ventures has set March 13 as the release date for Director Mark Newton's "Attack of the Southern Fried Zombies" on DVD and all digital platforms. The film, f.k.a. Kudzu Zombies, which won the honor of "Goriest Film" at the 2017 FANtastic Horror Film Festival in San Diego, will also be released in Los Angeles for an exclusive run at Arena CineLounge on Sunset Blvd. starting March 23, announced Daniel Wood, p.g.a. In "Attack of the Southern Fried Zombies," the kudzu covered hills of Charleston, Mississippi, notable as Morgan Freeman's hometown, are ground zero for GloboBioTech testing of their experimental herbicide Quadoxin, which goes horribly wrong. Lonnie, a crop duster pilot, must lead a mismatched group of survivors to escape the deadly zombie horde after the Quadoxin transforms the citizens of the small town into zombies. The film stars Timothy Haug, Moses J. Moseley (The Walking Dead), Wyntergrace Williams (This Just In), Megan Few (Demons), Escalante Lundy (Django Unchained), Kaitlin Mesh and Clay Acker. Zombie Makeup and SFX by Jonathan Thornton. From a screenplay by Christian Hokenson, and produced by Daniel Wood, p.g.a., Mark Newton, Juri Koll and Per Ericson, with co-producer Stephan Stromer.